Since early October, an unassuming exhibit of 36 paintings, drawings, and sculptures has lined two beige hallways on the sixth floor of Haaren Hall, part of John Jay College of Criminal Justice’s campus. The catalog is photocopied and stapled together, available in a stack for any passerby. Students hurry through without looking up from their phones. There are probably a thousand exhibits just like it in colleges across America, beautifully put together in hopes of enlightening their students. Except that this one managed to attract the ire of the United States military. 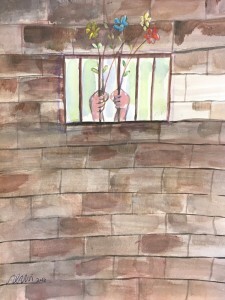 The exhibit is Ode to the Sea: Art from Guantánamo Bay, featuring work from eight artists: four current prisoners and four former prisoners who have been released from Guantánamo after having been cleared. The title of the exhibit refers to the common thread throughout most of the art — the sea — even though the artists can’t actually see the water from anywhere in the prison due to tarps thrown over all the fences. Whether stormy, calm, sunlit, or dark, the metaphor for freedom just out of reach is staggering in each work. The military changed its policy regarding the art of Guantánamo prisoners after finding out about the exhibit, saying anything created at Guantánamo is property of the US government. Authorities declared that not only will art no longer be allowed to leave the prison, it can also legally be destroyed. 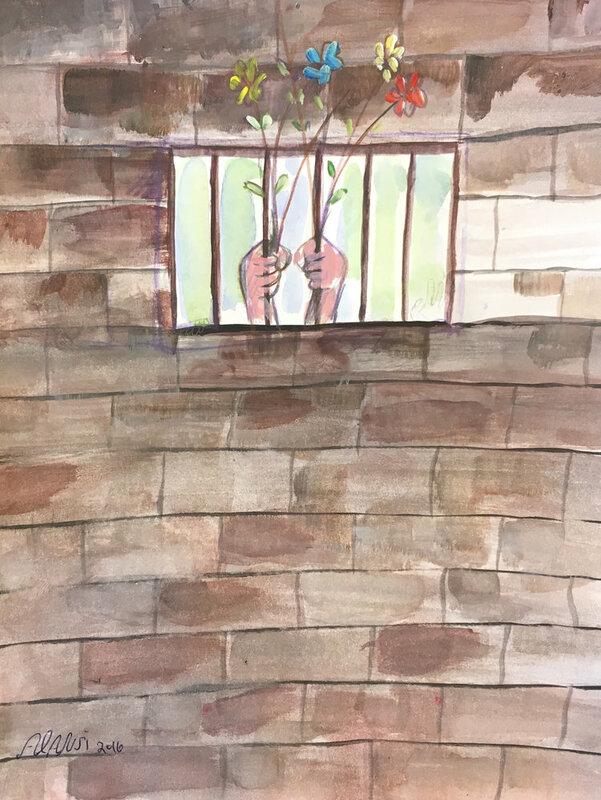 A spokesperson for the Pentagon, Air Force Major Ben Sakrisson, said that “questions remain on where the money for the sales was going.” Presumably, it’s going to the four artists who have been released, since art by current detainees cannot be sold. In fact, The Miami Herald reported that one former detainee wants the proceeds from his art to help buy expensive medication for his sick mother. Art censorship and destruction are tactics fit for terrorist regimes, not for the U.S. military. The art poses no security threat: It is screened by experts who study the material for secret messages before it leaves the camp, and no art by current prisoners can be sold. Guantánamo detainees deserve basic human rights as they await trial. Taking away ownership of their art is both incredibly petty and utterly cruel. Fortnunately, the Pentagon is backing off its previous threat of incinerating art by the Guantánamo Bay detainees. Unfortunately, they still maintain all of it is the property of the U.S. military and will not be permitted to leave the prison. Silencing people by burning their art, whether it is photos, novels, albums, or comic books, is nothing new. Neither is censoring it by restricting access to it. People justified burning comic books because at the time they thought comics could never be great literature. So, convincing people that no lasting art could come out of a prison, where even the most basic supplies have to be restricted for the prisoners’ own safety, is not a far leap. The exhibit is free and open to the public and runs through January 26, 2018, at Haren Hall (899 10th Avenue at 59th Street, on the 6th floor in the President’s Gallery, New York City). The exhibit is open Monday to Friday, from 9:00 a.m. to 5:00 p.m. (except January 15). If you can’t make it in person, you can peruse the full catalog at the website.